Photography by Elisa Watson for Nourish Magazine 2014. So all of a sudden we are into our second week of 2014. Time really is speeding past me at the moment! As this is my first post for 2014 I thought I would run through what intentions I have set for this year for myself and for Kenkō! Normally each year I set myself "resolutions" like many others. Then I find myself half way through the year depressed as I have not been able to reach these resolutions, even if they were rather unattainable in the first place. Resolutions put so much pressure on our sub conscious and can be quite dangerous to our stress levels and our frame of mind. That inkling in your mind that you MUST lose weight, you MUST quit drinking and you MUST get a promotion or achieve something almost fairy tale worthy! This then begins to creep into your head always putting feelings of guilt or anxiety that you're not doing what you wanted to do/where you wanted to be. So this year, resolutions were thrown out the window for me, and instead I thought I would set myself some intentions. And this seems to be quite a popular concept this year! So before I tell you about the Indian Salad pictured above, here are my intentions for this year, however if things don't go to plan, which they rarely do, so be it! Life will have taught me different lessons instead. I was meant to finish university last year (and achieve a ridiculous list of other things) then when I started this blog in June my world flipped upside down and lead me down another path. It created an opening for me to do things I thought would be unimaginable such as magazine spreads, and even be offered something more exciting (which I will tell you guys about soon, however if anybody saw the last Yen Magazine they will already know the spilt news...!). - I intend to keep becoming more healthy and remain active with my swimming and maybe even try cross fit! - I intend to finish working on this very exciting little something and create something I will be very proud of. - I intend to do more for charity and help those who need it when I can. - I intend to turn Kenkō into something bigger, to inspire health among more people. - I also intend to travel with my boyfriend, and get more inspiration in learning different cuisines from around the world. Now that the belated New Years spiel is over, let's get onto what we all really care about. FOOD. I was lucky enough to again contribute to the latest Nourish Magazine issue, choosing to do a variety of salads inspired from all corners of the globe! This is the first salad I will be sharing with you from the magazine. It is an Indian inspired salad and I cannot even begin to explain how delicious this baby is. Every mouthful has you wanting to go back or more! If you want to see more of my worldly salad recipes, be sure to check out the latest issue of Nourish Magazine which is now available in Coles, Woolworths and news agencies across Australia. It is also downloadable on the iTunes Newsstand! I would love to hear your thoughts on the recipe, and also if there is anything you guys would like to see Kenkō do or post this year! I also hope you had an awesome holiday period and are enjoying the new year so far! + to serve natural yoghurt, coriander and crushed papadums. 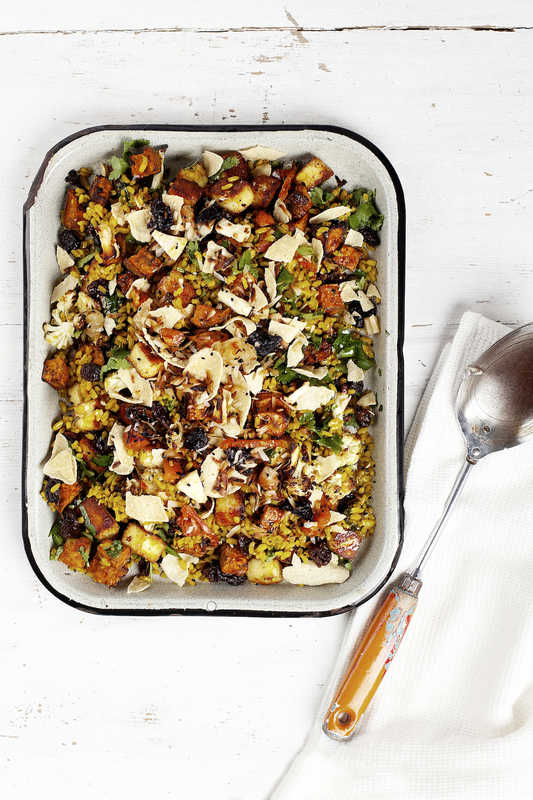 Cut the cauliflower and sweet potato into small pieces and place onto a baking tray. In a small bowl, mix together the yoghurt, garam masala, cinnamon and 1 tsp of the cumin powder. Next, dollop this mixture onto the cauliflower and sweet potato. Using your hands, toss the sweet potato and cauliflower until coated. Splash with 1 tbsp of coconut oil and place into the oven for around 30 minutes. In a pot of boiling water, add in the turmeric and saffron threads. Gently mix then place in the brown rice and let simmer until tender. Whilst vegetables are in oven and boiling water on the stove, throw the paneer cheese (cubed into 2cm pieces if not already none so) into a non stick fry pan and cook until golden in 1 tbsp of the coconut oil and 1 tbsp of coconut cream. Once done, place into a bowl. Add the raisins/sultanas. In the now empty dry fry pan, place in the seeds and remaining spices and cook for 2 minutes until fragrant. Put the seeds on top of the cheese/sultanas. Cut up the dried fruit into fine threads and throw into non stick pan. Fry for 2 minutes until lightly golden. Take off heat and set aside. Once brown rice is tender, remove from heat, drain and run briefly under cold water. Place the brown rice (with no excess liquid) into the bowl and toss in the cheese, spices and sultanas. Chop up the coriander (including the stalks) and throw into the salad. By this stage the vegetables should be tender and golden in the oven. Remove the vegetables from the oven and place into the salad. Toss together into the rice mixture with the remaining 1 tbsp of coconut oil. Top with the crushed almonds and papadums, the remaining chopped up chilli and serve with extra coriander and yoghurt.